The price is attractive but it's probably worth checking out other options too. Great price. Sounds pretty decent for the money. USB cable interference. Cable easily dislodged from mic. There are times when convenience is paramount and Prodipe's ST-USB microphone is designed for such moments. 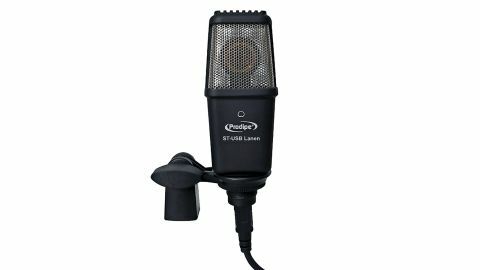 "For a budget mic, ST-USB sounds pretty good, with a bright detailed sound and quite broad cardioid pattern"
It's a medium capsule cardioid condenser mic with integrated A/D converter (16-bit, 44.1 and 48kHz) and USB connectivity. So you simply plug it into the USB slot on your computer and it's buss powered and ready to go. PC users can also grab an additional ASIO 2.0 driver if required. Once powered up, a blue LED illuminates the capsule, and mic gain is handled at software level via your computer's audio driver. For a budget mic, ST-USB sounds pretty good, with a bright detailed sound and quite broad cardioid pattern. Nevertheless, its USB cable seems to carry low-level computer interference (not resolved with a ferrite choke), and in use it's also far too easy to dislodge the USB plug at the bottom.